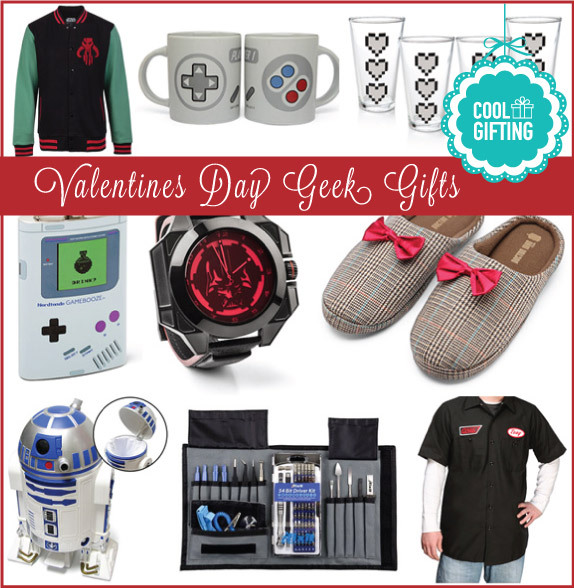 Each Power-Up Heart Pint Glass 4-Pack has four glasses which each have three 8-bit hearts on the side. Add cold beverages to them, and the hearts will change color to a deep red. Now your glass is powered up. As the beverage passes from the glass to your stomach (or get warm), the hearts will fade. That’s when you know it’s time to refresh your drink. 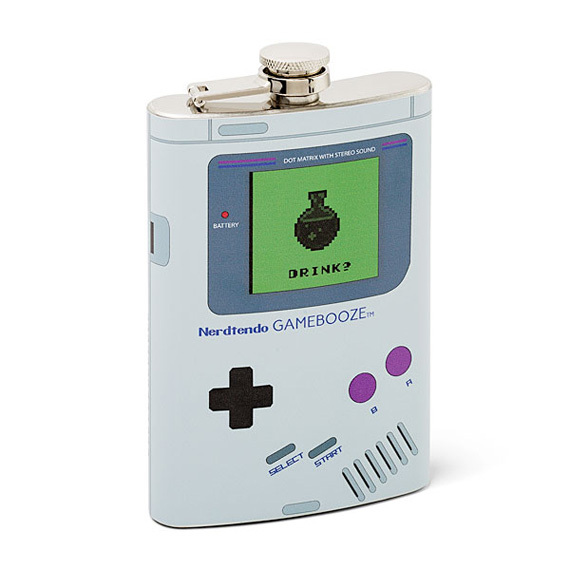 This flask lets you relive the joys of youth, only with alcohol. The CDC points out that alcohol can impair your judgement, reduce your reaction time, and cause a loss of motor skills. 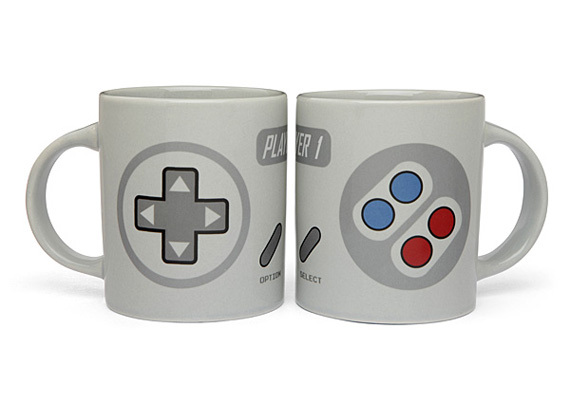 Which means, basically, this flask isn’t going to make you any better at Tetris. We can live with that. 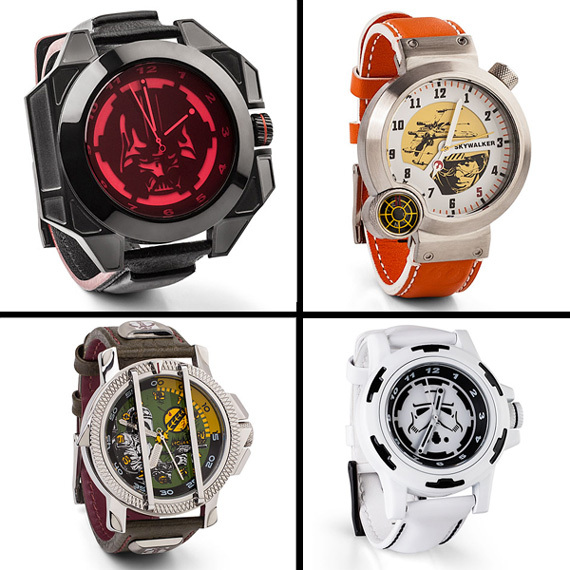 These designer watches are simply stunning and a must-have for the grown-up Star Wars fan. Each watch features a genuine leather strap, stainless steel construction, Japanese movement, and tiny details that fill our fanboy/girl hearts with joy. One such detail that proves these watches were designed by people as in love with Star Wars as us? The 5 on the face of the Luke Skywalker watch is red. (Red. Five. OMG.) The dial on the Darth Vader watch features the symbol of the Empire. Both watches are hefty and extremely well-crafted, so they’ll be sure to last as long as your love of Star Wars. It’s Matt Smith’s signature tweed + bow tie look. And they look comfy, with an open back. 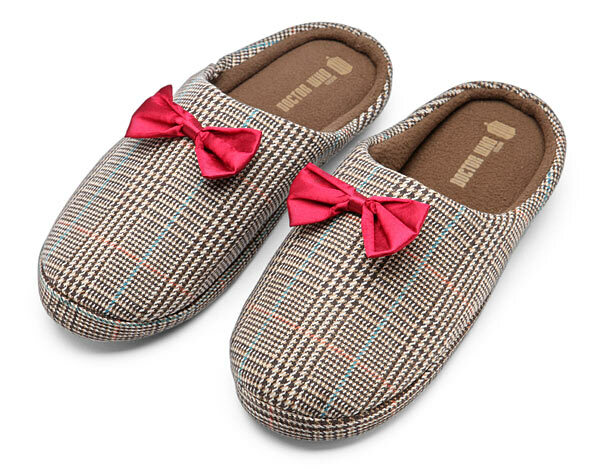 They also have a hard, nobbledy bottom for when you have to run out to the mailbox (or travel through space and time) in your robe and slippers. Trash is just not that cool. Not only can it be dirty and odorous but it’s simply low-tech and boring. At least that’s what we used to think… until we saw this amazing R2-D2 Trashcan and learned to love trash. 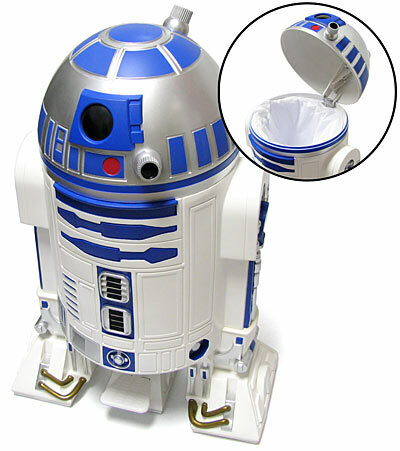 This stylish trash receptacle is imported from Japan and is an incredibly detailed replica of R2-D2. Step on R2’s center “foot” and his dome swings wide to collect your expired TPS reports and leftover wookie dung. With almost all the information in the world readily available at our fingertips, attaining the repair advice and solutions necessary to perform tech fixes is easy. It’s the actual equipment needed to perform said repairs that becomes an issue. 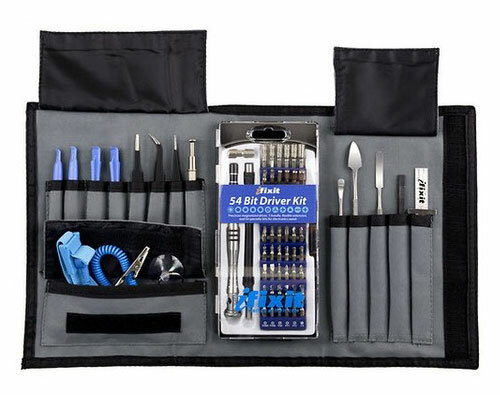 With the Pro Tech Electronics Repair Tool Kit, you’re household is set with tools for repairing small electronics, soft plastics, and any devices or appliances that have electrical currents. 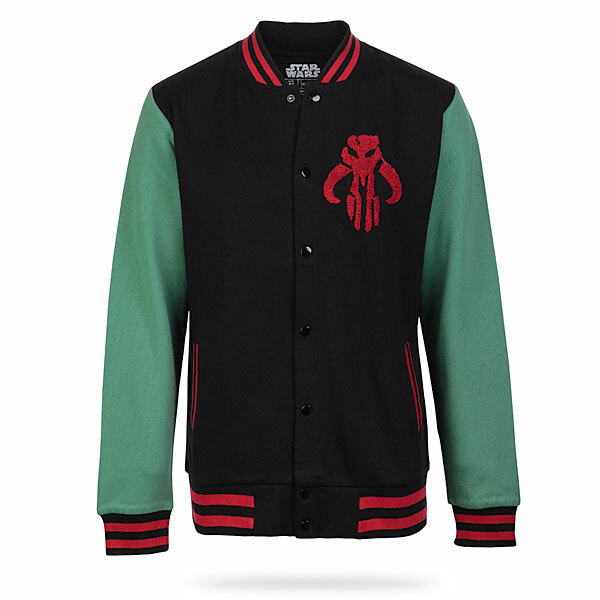 We don’t know what high school you would have to attend to get this Boba Fett varsity jacket, but we imagine their sports are a lot more dangerous than basketball and soccer. There are probably rules about bringing jetpacks to class, and the proms probably have an awkward number of Hutt crime-lords. The Pocket Retro Game Emulator looks a bit like the GameBoy Micro but that’s where the similarities end. 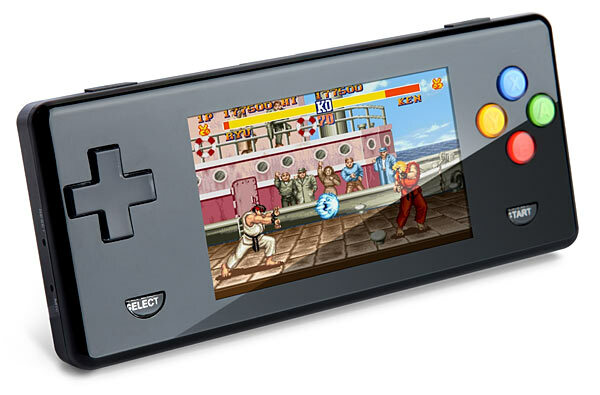 Load on NES, SNES, GBA, Sega Genesis, or Neo Geo roms and play your old favorites in the palm of your hand. With 4GB of built-in storage and (a micro SD slot for expansion) you can bring every single game from the best classic consoles with you. Of course, it doesn’t stop there. You can also play movie files, audio files, FM radio. You can view images or read ebooks. You can even do Hi-Fi voice recording. 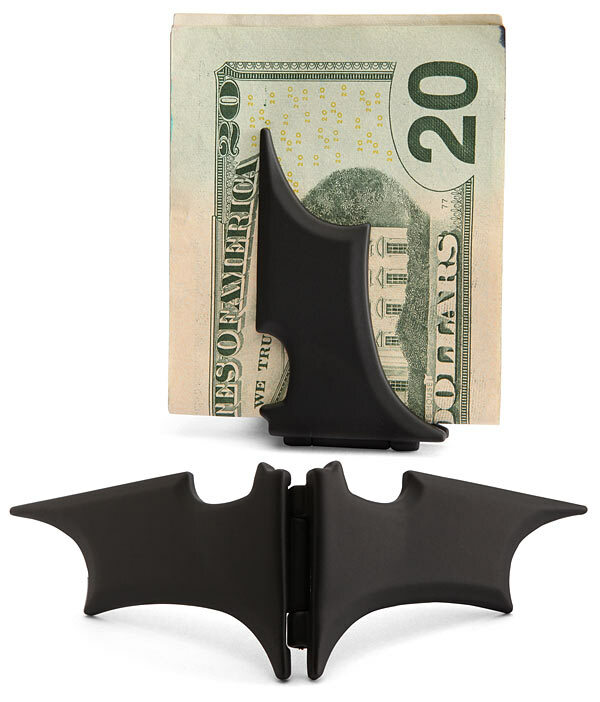 It’s up to you to fly your Bat flag high with this super sweet Batman Money Clip. It’s a tiny batarang that folds protectively over your precious money, keeping it from flying away. Die-cast, sheathed in a ninja-like matte black rubberized coating and with a magnetized grip, this is the stealthiest and most effective batarang money clip on the face of the planet. Well, hello and welcome to your first day on the job at Stark Industries. The bathrooms are over there. The kitchen is over here. 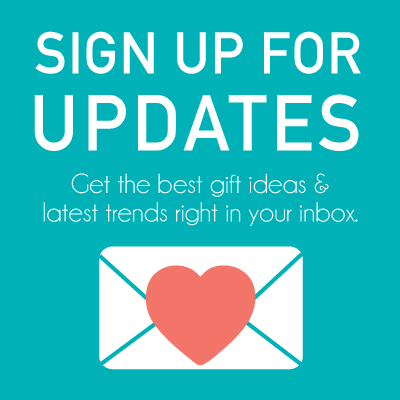 Oh, and don’t bother ordering business cards. It’ll be named something different next week. But here’s your work shirt to get you started. 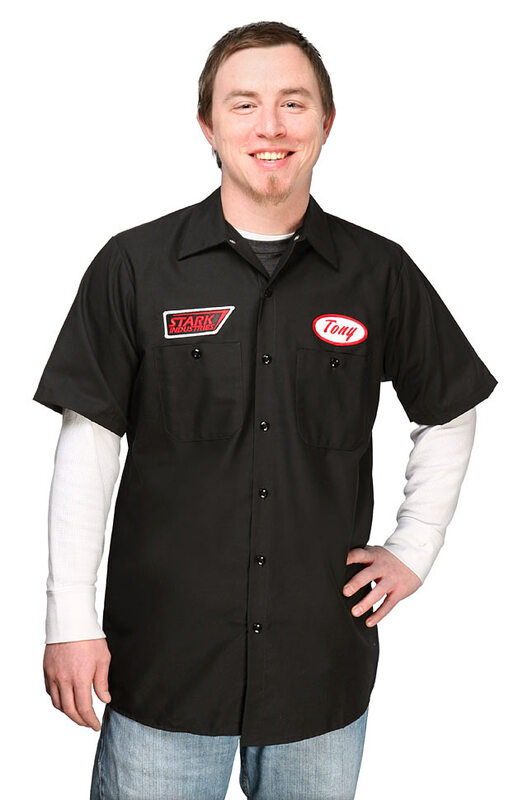 This Stark Work Shirt features a 3 1/2″ x 1 1/2″ embroidered patch with the Stark Industries logo and a red and white embroidered, oval nametag declaring you “Tony”, ironed on and then tacked in place.